The GOP chairman of the House judiciary committee is trying to boost his immigration-reform and DACA-amnesty bill by including a separate bill to accelerate the immigration of Indian and Chinese tech-workers. The separate bill, numbered H.R. 392, allows faster delivery of green cards once Indian or Chinese guest-workers — such as H-1B or L-1 visa workers — get initial approval for immigration. The delivery process does not allow more than 7 percent of each year’s green cards be given to approved people from any single country, so many approved Indian and Chinese workers are stuck in their own country backlogs. H.R. 392 removes the per-country caps and creates a single waiting line for all applicants, so ending national backlogs. It does not increase the number of green cards. The bill is being pushed by a huge population of Indian professionals who are waiting for their green cards, and who have set up organizations to lobby legislators for their acceleration bill. Indian advocates say the population is as large as 1.5 million. 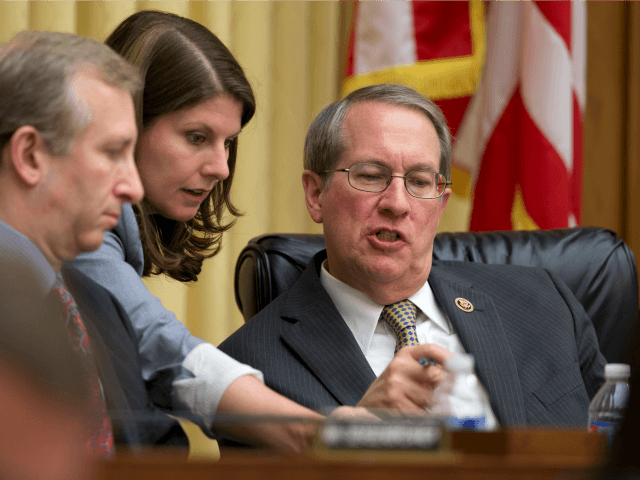 So far, they have won 317 House cosponsors for their bill — including more than 80 of the GOP legislators needed by Goodlatte to pass his own bill. “Chairman Goodlatte’s office, they reached out to us … they are also requesting for our help in pushing for the Goodlatte bill,” said Aman Kapoor, a citizen, and co-founder of the Immigrant Voice group which has been pushing H.R. 392 legislation since before 2011. As part of the deal [with Goodlatte], we have inherited the responsibility to make sure that we, all of us combined together, make phone calls [to representatives’ offices] and do local office meetings [with representatives], and only go to specific offices that have been identified in close coordination with the House judiciary committee. So these offices, there are 80 plus offices, all Republican offices. Fresco formerly worked as chief immigration staffer to the Senate’s Democratic leader, Sen. Chuck Schumer. Fresco helped write the 2013 “Gang of Eight” immigration giveaway, which helped the Democrats lose nine Senate seats in 2014. It also helped the GOP establishment — including Florida Sen. Marco Rubio — lose their 2016 nomination to a New York real-estate developer. We do not want anybody to make any phone calls to any Democratic offices. We should not be tweeting any Democratic offices about this bill, you should not be calling them, should not be Facebooking them, should not be meeting them. Even if you are meeting with them or going to their town hall, never ever, ever bring up Goodlatte DACA bill to them. Don’t tell them that the per-country [H.R. 392] bill has been added to Goodlatte DACA bill because no Democrat is going to work for this bill … We were advised by congressional offices not to reach out to Democratic offices otherwise we will upset them. Goodlatte’s office did not respond to Breitbart News. “Until the [immigration] laws are adequately enforced, we cannot trust anything that comes out of Congress,” said Bill Gheen, head of Americans for Legal Immigration PAC, which opposes the Goodlatte bill. Even if the House bill looks good, subsequent backroom dealmaking will convert the final legislation into a business wish-list, he said. Goodlatte’s deal ”does not surprise me one bit,” he said. Goodlatte’s reform-and-amnesty bill would raise employees’ wages and force a renewed Democratic outreach to American voters, because it would end the visa-lottery and chain-migration inflows of cheap workers and Democratic-leaning voters, and it would also give agencies more authority to block migration and quickly repatriate illegals living in so-called “sanctuary cities.” In exchange, Goodlatte’s bill would help Democrats and business groups by providing renewable work-permits for the 680,000 illegals enrolled in former President Barack Obama’s ‘DACA’ amnesty. Business groups sharply oppose Goodlatte’s bill because it reduces the number of imported consumers and forces up salaries paid to Americans. We have a strong and vibrant Indian community in my district. They’ve been kind enough to invite me into their community, I’ve been able to participate in many of their cultural events – I’ve even taken a stab at playing a game of cricket. Many of them have brought this issue to my attention and when Representative Chaffetz retired and the bill needed a new lead sponsor, I was eager to jump at the opportunity. I’ve heard their personal stories and the discrimination they face and uncertainty and fear they live with. Many of these immigrants are my neighbors and friends and they need a voice to stand up for them in Congress, to tell their story. The country-caps issue only emerged after 1990 because Congress allowed H-1B temporary guest-workers workers to apply for immigration, said Vaughan. This 1990 promise of green cards dramatically changed the H-1B program, which was created to provide a quick source of temporary workers, said Vaughan. Once the workers were allowed to apply for green cards, foreign “people were willing to put up with low pay and in effect, indentured servitude, because they knew they would get a green card at the end of it,” she said. The EB-1 route is reserved for “priority workers,” such as managers. Many of those are being snatched up by Indians carrying L-1a visas which label them as managers at India-based outsourcing companies. The EB-2 route is for “members of the professions holding advanced degrees or their equivalent.” The Indian applicants for higher-skill EB-2s tend to be H-1Bs hired by top-flight U.S. companies — such as Facebook or Intel — and they have to wait in line for roughly 10 years. The EB-3 path is for people defined as skilled workers, professionals or “other workers.” U.S. name-brand companies help many of their Indian H-1Bs apply for this lower-skill category, ensuring the waiting list is up to 70-years long. Including family members, the U.S.-resident population of backlogged Indians may reach 1.5 million, say some Indian advocates. The family members increase the backlog because spouses and minor children also need one of the 140,000 green cards to become full residents. Because of the national backups, Indians and Chinese employees have been approved for immigration but do not yet have green cards. So the federal government gives them repeat H-1B extensions or “Employment Authorization Documents” so they can work in good jobs while they wait for green cards. The total resident working population of white-collar graduates from all countries is roughly 1.5 million. That huge population includes the approved-but-waiting tech-workers, plus H-1B, L-1, and other visa workers. The current population of H-1B workers in the United States is at least 450,000. An additional 330,000-plus foreign graduates are working in the United States under the disputed “Optional Practical Training” program and an estimated 350,000 more work under L-1 visa program. Indian visa-workers mostly work as lower-level professionals in the software business. Chinese mainly work in the sensitive pharmaceutical and science sectors. But many of the foreign guest-workers hold good jobs outside the software and science sectors — in the New York fashion business, in pharmacies, engineering, accounting, academia, and healthcare. That huge population of guest-workers and would-be immigrants is twice as large as the population of 800,000 Americans who will graduate in 2018 from colleges with skilled degrees in healthcare, business, science, computer, math, engineering, or architecture. The economic impact of that large foreign population on white-collar American graduates is huge — even for college graduates outside high-tech careers. U.S. graduates leave careers where the huge supply of foreign tech-workers drag down salaries, and they move into other careers — healthcare, journalism, design, management, sales — so dragging down salaries for other Americans. The huge inflow of foreign workers is opposed by American activists, including Dawn Casey, an American who was forced to train the foreign outsourcing worker who took her job. People from NY, Connecticut, Alabama, California and all over came to be heard. Yoder’s acceleration bill will worsen the foreign-worker problem, said Vaughan. For example, Indian graduates are more likely to take low-wage H-1B jobs in the United States if they know they also can quickly win the deferred bonus of citizenship, said Vaughan. The government-granted green card is extremely valuable to foreigners because it allows them — and all of their descendants — to live in the wealthy, low-corruption United States. It also allows foreigners to use chain-migration laws to import their retired parents, plus their siblings and their spouses and children — and all of their descendants. The ability of U.S. employers to hire foreigners who want government-provided citizenship is far cheaper than hiring Americans who want company-paid cash salaries. Removing the country cap will also allow the H-1B workers’ spouses to get work permits for jobs sought by Americans, said Vaughan. In 2015, officials working for former President Barack Obama created up a work-permit program for the H-1Bs’ spouses, under which officials gave out 100,000 work-permits for guest-workers waiting for green cards. That H-4 program is now facing a lawsuit, but it would not be created if the waiting-list were shorted by the bill, Vaughan said. Goodlatte’s bill does not allow any reductions in the huge annual salary-cutting inflow of H-1B, L-1, OPT and other guest-workers, and it also increases the number of EB green cards by roughly 55,000 up to 195,000. Business strongly backs those programs because they sharply increase the supply of white-collar professionals, so forcing down average salaries. Advocates for H.R. 392 say removal of the country cap would not increase the annual inflow of EB green-card workers — but simply shift more of the 140,000 annual green cards to the Indian and Chinese tech-workers. Kapoor told Breitbart News that the per-country bill would increase diversity by reducing companies’ incentive to hire Indians. Employers now favor Indian guest-workers because they cannot get through their national backlog and cannot quit their employers for fear of losing their chances for a green card, he said. “It is a jail, it is like indentured servitude,” Kapoor said. I can say from my representation of many of my [Indian] clients, that I have found almost zero interest in the H-1B program amongst Indian workers. This is evidenced by dramatically reduced student visa enrollments in U.S. schools from Indian nationals. They would much rather come on [an approved] green card as opposed to being here on a temporary basis that can be revoked at any time and where they cannot start companies, or change jobs, or employ American workers. The Yoder bill would also solve the problem of tech-workers’ children aging out of the visa process while their parents are stuck for years in the green-card line, said Kapoor. Many of their Indian-born children — but not their U.S. born children — lose visa protections once they turn 21 and then must return back to India. Companies don’t want the Yoder country-cap bill to pass, Kapoor added. Company officials will say they support the bill, but “behind the scenes, they don’t do anything ” to help it pass, he said. One of the groups apparently supporting the Yoder bill is FWD.us, which was created by Silicon Valley investors to raise the supply and reduce the cost of white-collar professionals. we are in support of the bill (now Yoder's). we talk to offices about it all the time in DC and in the field. But FWD.us, “has not done anything,” Kapoor said. The Indians who are lobbying to pass the Yoder bill are no longer just H-1B or L-1 guest-workers but are people who have been given permission to immigrate and are waiting in line for their green cards, Kapoor. “This is how America is supported to be — this is a grass-roots effort,” he said, complete its own multiple advocacy groups and training.